25 Reviews of Christmas #10 - Scrooge McDuck steals the show in "Mickey's Christmas Carol"
Every fifth day is another “Christmas Carol” review, so today we’re looking at one of the best, or at least most nostalgic, versions, “Mickey’s Christmas Carol.” Remember to visit this page at any time for a collection of all 25 Reviews of Christmas articles. Enjoy! Review after the jump…. “Mickey’s Christmas Carol” is probably the first “Carol” I ever saw, and it’s still one of my favorites. To this day, it’s the imagery of this Disney classic that I most strongly associate with the Dickens novel, but that’s not just because Mickey was the one to introduce me to the story. At only 24 minutes, the short is certainly at a disadvantage from other, longer “Carols” in terms of adaptation, but the most remarkable thing about the short is that they really make every second count. It’s a highly abbreviated version of the story, but not a diluted one; perhaps some of Dickens’ depth and complexity is lost in translation, but those things that matter most – the messages, the heart, the atmosphere – are all there in full force. The attraction here, obviously, is the Disney characters, and they are used quite well. In fact, it’s very amusing, as the film moves along, to learn that the Disney cast had the perfect character for each part. Of course Mickey Mouse is Bob Cratchit – could any other performer, real or animated, capture the man’s innocence and good will so strongly? The same goes for the ghosts: Jiminy Cricket’s matter-of-fact, lightly stern nature makes him the only choice for Christmas Past, Big Pete is the only Mickey character scary enough for Christmas Future, and though he’s a bit obscure, the giant from “Mickey’s Beanstalk” simply has to be Christmas Present. Who else could it be? There are some strange decisions, though they work out splendidly. I wouldn’t have initially pegged the temperamental Donald Duck for nephew Fred, but Donald has always had a sweeter side, one that, exploited in full, makes for a memorable performance. Goofy as Jacob Marley? Odd but awesome. 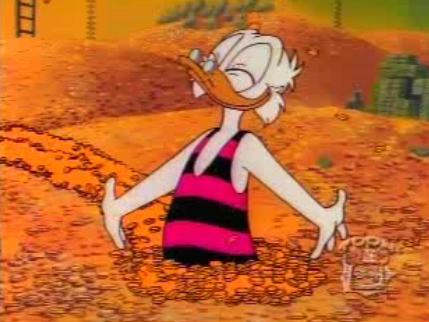 But the best character, of course, is the one making his animated debut: Scrooge McDuck. If you grew up in the eighties or nineties, chances are you can sing or hum the theme song to “Duck Tales” on cue, and that means you know and love Scrooge McDuck. He isn’t just rich, he embodies excess, gleefully collecting, hoarding, and even swimming in his own money. And he loves every last minute of it. If Fox News hates The Muppets for daring to question their place in the world in their new movie by standing up to a cruel jackass whose wealth clearly excuses him from all worldly transgressions, then I assume the Fox offices have pictures of Scrooge McDuck and his money-swimming-pool plastered all over the walls; someone who takes this much pride in being rich must be their poster boy. But I digress. 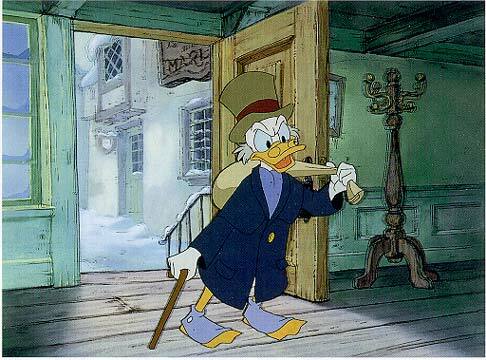 Scrooge McDuck was originally created in 1947 as a comic-book character, but it wasn’t until “Mickey’s Christmas Carol” that he debuted in animation. As his name suggests, Scrooge takes his cues from Dickens’ classic misanthrope, making him the perfect duck for the part. 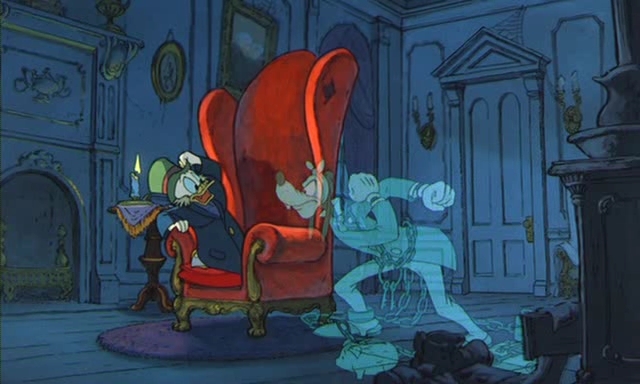 The things that make Scrooge so lovably terrible make this short shine. Where other Scrooge’s are downtrodden and solitary, McDuck loves his life of greed and shoves it in everyone’s faces, making for a unique “Christmas Carol” dynamic one isn’t likely to see elsewhere. Alan Young’s performance as Scrooge, in this or on “Duck Tales,” is just spectacular, thanks in no small part to that irresistible Scottish accent. It’s one of the most memorable animated character voices you’ll ever hear, and Young is in top form in this short. 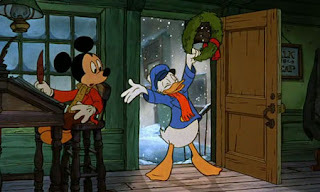 In 1983, at the time of the film’s release, Mickey hadn’t starred in a theatrical cartoon in over thirty years, and Walt Disney Animation was still a ways away from breaking into a second Golden Age with “The Little Mermaid.” “Mickey’s Christmas Carol” came during a dark period for the studio, and may be the highlight of a very troubled time for animation. At the very least, the short is a visual marvel. As a theatrical release (paired with a re-release of “The Rescuers”), it was animated in widescreen (at the 1.66:1 aspect ratio), a rarity for Mickey, and the results are spectacular. London is animated richly and warmly with a beautiful, muted color scheme. The character animation can’t be beat and the entire production strikes the perfect atmosphere for Dickens’ story. That’s not to say the narrative itself is any slouch. Though concise, the film maintains the sophistication of Dickens’ novella. Story and visuals intersect marvelously on several key occasions; the part that has stuck with me since I was little is the graveyard sequence at the end, which starts off eerie, becomes creepy, and ends with a horrifying plunge into flames for Scrooge. 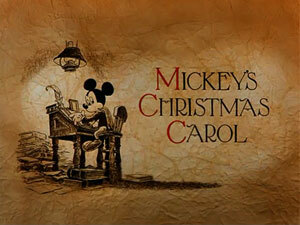 For young children, there’s no better way to learn the story of “A Christmas Carol” than with Mickey. It may be simplified, but an awful lot of the story’s power is still there, and it doesn’t pander. For adults, it’s just as enjoyable, if only as an excuse to dive warmly into nostalgia. Older viewers may think back fondly to classic Mickey cartoons, while those my age will inevitably start humming the “Duck Tales” theme as soon as Scrooge appears.